Can I really keep my blonde and go blonder?! On the heels of my Ombre within two weeks my hair started to get a little brassy. It went from a nice blonde to a slight brassy/brown/orange mess. 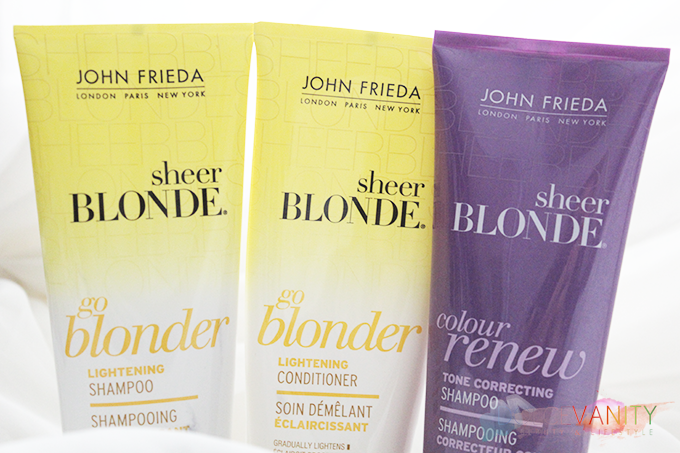 Still new to all this 'blonde' jazz I took myself to Boots and decided to give the John Frieda Go Blonder range a go dropping in the shampoo & conditioner to my basket. While browsing I also noticed the Sheer Blonde Colour Renew Tone Correcting range so I thought what the hell - let me pick up the shampoo too. Sheer Blonde® Go Blonder Lightening Shampoo gradually lightens blonde hair for a year-round sun-kissed look. The formula, containing a natural Lightening Complex, gently reduces the colour pigments in the hair. Upon getting home it was one of the first things I decided to do after scoffing down my Nando's veggie burger. I'm not a big fan of shampoo, actually I'd rather not use it at all if possible and this shampoo was no exception to the fact - I do not like this shampoo but I thought if it gave me the benefits I need I can survive. wrong! The shampoo and conditioner have citrus and chamomile in the blend of the two scents is quite pleasurable, should I repeat it ? "I'm a fan of citrus" Upon rinsing it out my hair felt as if all the moisture and life had been sucked out of it completely. I never had straw hair before but now I definitely did and straw hair wasn't for me. I'm not sure if you've ever experienced when the hair just feels ever so dry the feel of it makes your blood run cold with goose bumps - if you have then you feel my pain. Sheer Blonde® Go Blonder Lightening Shampoo and Conditioner gradually lighten blonde hair for a year-round sun-kissed look while restoring moisture and healthy softness. O.k. my hair felt not so bad after using this maybe due to it being coated by the cones in the ingredients - big fat uh no! from my natural sisters. Now onto the Colour Renew Tone Correcting Shampoo + Conditioner - in plain words - this sucked. Sheer Blonde® Colour Renew Shampoo and Conditioner neutralise brassy and yellow tones and help make colour treated hair appear bright and salon fresh. Results are noticeable after just 3 uses. Conditioner renews softness for fresh-looking blonde. Instead of keeping the colour bright it seemed to of just blended and darkened the blonde. I cannot say that since purchasing these items in May that I have got the desired results. Such a shame when a product doesn't work out. How many times did you use the toner conditioner? I found I had to use it about 3 different times to see a difference. Hey, I've used it every other wash I've done since I purchased it to give it a good trial run. I was thinking of buying this to keep my ombré blonder but I don't think I will. Especially after reading about how dry the shampoo made your hair! Eek! Your hair looks lovely though! Not a fan of these either, I used the go blonder spray and it turned my hair to straw, what an error. The shampoo is drying too, but it did liven up the blonde. I prefer the other conditioners in their blonde range.